The last quarter of the year marks the homestretch of business to business marketing campaigns. The last three months of the year show monthly calendars of almost daily local and national holidays, observances, and state holidays. However, you may have to take out a to do list first of the things you need get a parking on before you take the leap to the airport and fly to your holiday get away. Take a look at the three-point list below of how to manage a B2B marketing project while catching up with the holiday rush. Start planning a perfect holiday spree by ticking the boxes of important dates of your business calendar for the year. The question, “Do your business prospects take holidays off” & “When”, will help you determine the perfect time on plotting the remaining working days of your campaign, and the start date of your official holiday leave. Have both your active and non-active days synced with that of your telemarketing team to get an organized schedule of pauses and start offs. Related: Outbound Telemarketing: To Outsource or Not to Outsource? The pause should start on the first day of your scheduled holiday leave which should sync with that of your prospects’. Make sure that your working team’s calendar should be blocked from all appointment setting activities – this will ensure that no lead or appointment would be posted during these days off, and no chance for lost deals. The “Start” date to resume the telemarketing calls must fall on the day, you and your prospects, or most of them, come back to work. Wouldn’t it be so relaxing to sip on a glass of vodka, while in a vacation island, without the hassle of getting bugged by email alerts – like lapsed appointments? Email is the most legit and formal medium for business to business communication. Though mobile calling and texting, and the social media come in handy for both personal and business connections, it is best that business talks are funneled into just one venue like email. This will help you avoid missed communications and even missed business transaction meetings. You may follow a very simple Out of Office (OOO) reply format like “I am currently out of the office for the holidays and will be back on (date). For urgent matters, you may reach me at (number)”. However, leaving contact information in your OOO email reply will be up to your discretion, as this should be dependent on the nature of your work or business. Ideally, a lead generation campaign must follow a synchronized pattern workflow of tasks, reports and schedules in a streamlined process which involves you, your prospects, and your telemarketing team. So keep everything in place in the office before you leave for a week or two, with no calls, all bustles. Make holidays productive, read more sales and marketing tips and tricks, visit Callbox blog. Get your lead generation campaign ready for 2016! Revamp your strategy with multi channel marketing approach! Learn more how to get more customer. There’s no question about outsourcing your B2B telemarketing. Because of the supposed benefits it brings, contracting the services of a marketing company is an attractive and convenient course for improving your bottom line. But we want to emphasize the word ‘supposed’ here because we have a strong case to do so: Not all telemarketing companies are capable of bringing out the best of outsourcing. The best B2B telemarketing companies treat your customers as if they were their own. Strong customer service skills means handling questions about the finer details of your business on the fly. It means knowing how and when to vary the scripts. Not every call is identical, and not every situation can be resolved in the same way. The people who take the time to call your business are often your most qualified leads. These phone calls need to be serviced promptly and professionally, and these customers need to be left satisfied. The best B2B telemarketing companies understand and value these phone calls as an opportunity to truly make a difference for the client. Customers have options, and competition can be high, especially with the Internet. Customers have grown accustomed to immediacy. Immediate attention and a quick resolution can make all the difference in lead generation and sales. The right B2B telemarketing company can help your business with more than just sales and lead generation. That’s an important part of it, but they can also help with important communications services such as market research through outbound surveys, database maintenance, voice broadcasting announcements, and live web chat. You see even at this era, telemarketing is proving itself against the rising digital strategies. Indeed telemarketing is unstoppable. When handling another business’s phone calls and leads, it is important to be ready in any type of situation. Remember, the call handlers are an extension of your business, so training is a crucial element to a successful relationship. Call handlers should be well-versed with the company and understand client interaction. They should understand the FAQs, for quality product knowledge. They need to understand the qualifiers to be a solid lead, appointment or sale. How do you know if a company has what it takes? Simple: RESEARCH. Visit the company’s site and rummage through content such as blog articles and case studies. Also, search for online reviews about its services and solicit opinions from its previous clients. Speaking of reviews, Callbox Earns #1 Spot In Two Lead Generation Services Rankings For 2015. Related Post: Will you move to mobile this 2015? 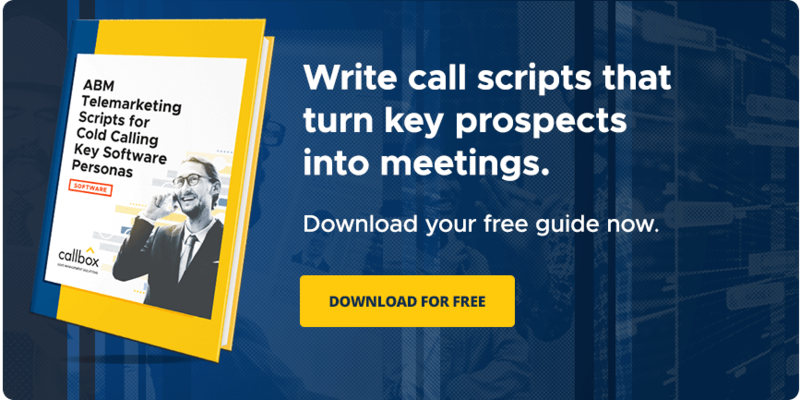 Picking up the phone and having a direct conversation with your prospect is one of the best options for an active marketing strategy and can significantly increase lead generation and nurturing initiatives. In fact, Margin Media  reported that marketers qualified over 80% of leads as high or medium quality from telemarketing activity. Cold calling might be an aggressive method but delivers fast ROI for businesses. It has helped Callbox increase its sales and revenue. However, incorporating it with other channels might boost your brand awareness and achieve excellent marketing results. Learn more about Multi-Channel Marketing and why it’s worth investing. So it’s up to you. Whether to focus on one productive strategy or try something new, you”ll never know — you might as well double your production. We have a list of case studies to prove you that telemarketing is still effective. Check them out! It’s easy to get anxious when you talk to someone, especially if it’s a business executive that needs an attitude adjustment. In this post by Revenue 365’s David Mackey, we examine the five important steps to cancel out anxiety and boost the confidence levels of cold callers. Is it because you don’t like talking on the phone? You’re afraid of something thinking you’re annoying and pushy? You don’t want yet another person to hang up on you? Once you can nail down the actual reason you get anxious, you can confront it head on. A lot of times, the anxiety comes from taking the whole situation personally. When you can identify the real reasons you get anxious, you can sort of coach yourself to think about the whole situation in a more positive (and realistic) manner. Change the way you think about cold calling. Instead of thinking that your call is an unwanted interruption and a waste of time, think of your call as a way to inform your prospect about a valuable opportunity for their business. Stop thinking about you—how you sound, how well you presented the information, how long (or short) the conversation was. Make your call about educating and helping the prospect. Create a rough outline of your conversation. Notice two keywords: rough and outline. It may go against everything everyone else has taught you, but do not write out a word-for-word script. Do you ever read from a script when you’re talking to someone face-to-face? I sure hope not! With a full script, you just read right from it and lose any opportunity for deeper connection with the prospect. Conversations happen naturally, so should your sales call. However, it is wise to give yourself some guidelines. Write down a specific question, a statement that will transition you into learning about the goals or challenges of the company, or the names of connections you may have. You want your outline to be an aid, not a crutch. The more you do something, the more natural it becomes. So, practice your sales calls ahead of time. Actually hold the phone in your hand (or put your headset on—whatever it is!) and do dry-runs of your calls. Practice your greeting, your transitional statements, and your questions until you’re comfortable. When you feel prepared and confident before the call actually happens, you’re much more likely to retain that confidence when it does happen. It can be easy to beat yourself up when you only remember how many failed calls you have had. When you actually record how you’re doing, you’ll have unbiased documentation of how you’re actually doing. Your results may surprise you! Take it one call at a time. Breathe in, and start with one call at a time. Before you know it, you’ll feel better about making sales calls. Get qualified leads, contact us today! People nowadays stumble upon the words telemarketing and telesales every so often. Numerous times, if one is a stranger to the B2B industry, it is easy to say that both are one in the same. We owe the confusion to the prefix tele, but the similarity ends there. While both use the telephone as an audience communication channel, telemarketing and telesales fill distinctly essential roles in the growth and prosperity of a business enterprise. Furthermore, telemarketing takes a long time to work its magic. While it is not directly involved in winning a sale, it is nonetheless essential in keeping a prospect constantly interested with a product or service. Telemarketing uses lead nurturing mechanisms to verify information and determine whether a decision-maker is “warm” enough to consider buying the product or service, in which case B2B appointment setting comes in to open a can of sales opportunities. It makes use of callers who are trained simply for securing a prescribed number of sales a week. Making sales pitches for products like enterprise software may look easy, but experience and an understanding of buyer psychology goes a long way in terms of bypassing any potential sales barrier. Between telemarketing and telesales, which is more vital for providing better revenue? Integrity Business Connections makes a good point by saying that telemarketing is more suited for B2B, since the “buying cycle is much longer and their sale order value is quite high.” That leaves telesales to B2C, where speed and volume form a large part of business strategy. But why not have the best of both worlds? For Katie Smith, marketing communications manager of ThomsonLocal.com, the “most effective (if potentially costly) method is an integrated campaign of Telemarketing (plus a variety of other traditional marketing research initiatives) to identify lead generation followed by an outbound Telesales campaign.” This concept, she adds, is proven to deliver better results in lead generation as well as sales. Close more deals with our lead generation services or learn more B2B marketing ideas. Sources: Telesales vs. Telemarketing, What is the Difference Between Telemarketing and Telesales? Businesses in the B2B market depend on their telemarketing platforms for effective lead generation and appointment setting. Aside from that, effective dealings with B2B prospects can only be attained through an effective calling infrastructure that realizes quality customer experiences and hence business possibilities. But the main challenge has always been the same ever since: How can businesses achieve better ROI influx as well as produce quality clientele relations? This is worth investigating ad should be easily remedied by recent innovations in the field of CRM. Along with smart marketing software, auto-dialers can be your tools of choice for improving your telemarketing performance. Many companies in fact adopt auto-dialing software, integrating them with their existing lead management program for a solid marketing and sales operation. But the reasons don’t end there. To increase telemarketing efficiency, we can point to numerous other instances in which auto-dialers save more money and provide a higher rate of conversions from prospects to paying leads. Characteristic of a highly efficient call center is a highly productive team of callers. Using a combination of an automated lead management and nurturing database, businesses can eliminate the idle time waiting for a contact to pick up a call. Moreover, no longer would callers occupied with managing a large pool of prospect data than with honing their CRM abilities. They are able to get better at customer interactions. We’re not talking about a few bucks here. No, we’re talking about stashes of money that would have been wasted due to dropped calls. Consider this: you invested a large sum for setting up a telemarketing platform, expecting that you would at least be able to earn enough deals to cover your outlay. But without an auto-dialer, you would most likely experience high drop rates or to put it loosely, missed opportunities and a waste of a good investment. Auto-dialing software on the other hand ensures that each call would result in a sale. Another fact to consider in telemarketing is that quality customer engagements likely end in a purchase. It has been revealed that automated process, from lead prospecting to lead nurturing, present optimistic buyer likelihoods. This is due to the ease with which an automated system provides personnel, as explored in the first point. This year will highlight the need to manage big data, therefore requiring bigger lead management budgets. When put to effect, auto-dialing can provide clear and accurate reporting on each successful call with an agent, thus encouraging better strategizing. In B2B marketing, you can never refuse the ability of traditional inbound techniques, most especially telemarketing. If anything, telemarketing continues to be a preferable channel for many decision makers. It is seen as an effective way in fostering nascent business relationships. At least 28% of decision makers say that telemarketing makes them feel valued, based on a slideshow by SCI Sales. On top of that, the ROI it delivers is unmatched by that of any other B2B platform. But however one sees it, the main issue is more of application. It matters if the company that is handling effective telemarketing operations for B2B lead generation and appointment setting. In many cases, not many marketers are that skilled or lucky enough to maximize their telemarketing opportunities. More often than not, opportunities to set a sales appointment are lost along the way, entailing a waste of time and resources. No doubt rejections are a fact of life this side of the B2B world. But this shouldn’t hamper you from realizing short-term and long-term company goals. Your telemarketing strategies need revamping from time to time. And it is necessary for a business to perceive subtle trends in its campaign’s progress. Key metrics such as conversions and ROI should be taken note. Knowing such trends can help in revising your present telemarketing strategies. On the first contact, it is likely that a prospect defers his or her decision to set an appointment. They will rather reserve their decision for subsequent contacts. In between contacts, your marketing program should send out personalized emails that touch on topics that weren’t discussed during previous engagements. Moreover, emails allow you to control and influence a decision maker’s willingness to buy. Much to your chagrin, you simply cannot do anything about sales prospects who are simply not interested in buying your products. In such a case, it would be best to leave it at that. You can always depend on your B2B lead generation campaign to prospect for decision makers that are sure to partner up with you. It’s tough choice, but with a little persistence in generating B2B leads, you might just improve your sales performance. Telemarketing is not that easy. It’s not just about calling someone to make a sale. It is more about influencing others and solving pressing issues, tasks that an independent and highly competent outsourcing firm can live up to. Communication is as essential as air. And as organic beings, we have this impulse to talk or write or gesture, due to the fact that “no man is an island” (unless you are Tom Hanks living on one with a volleyball for a best friend). Moreover, human ingenuity has created ways in which we can surmount the geographic boundaries that challenge B2B telemarketers from achieving a closed sale. We have telephones now, and that’s a good thing. But still, as much as we want to praise such innovations, we are still confronted by the psychology involved in making a done deal with a client. Fortunately, here are some basic telemarketing ground rules to guide you before you go on a warm call campaign. Show respect; Earn respect. Telemarketers are one of many groups subject to jokes at the office water cooler or the local watering hole. The fact that they are “annoying” or at times “needy” have prompted many prospects to simply hang up, say “I don’t have time for this,” or make wise cracks just for the hell of it. It may sound rather discouraging to aspiring sales reps, but really, the problem is more in the approach. Aggressiveness is a driving force for success. But if you take it to the extreme, it can only be misconstrued as annoying. Thus, always think of your clients as busy people who have a lot of time in their hands, and they may think of you with high esteem. Be cordial. This could be listed under the previous item, but we should examine it as an independent fact. Being polite is the same as being professional. You want to be decent because you want your customers to know that you are not a typical B2B salesperson. As a matter of fact, you are talking to your client as a provider of solutions, whether the issues involve customer relations management or IT products for shipping companies. Be clear and concise. There is a thin film separating annoyance and an actual purchase. And it would take a wrong choice of words to puncture through that film and lose a potential buyer. Telemarketers are supposed to be masters of the spoken word. Whether you are reading through a call script or invoking the powers of spontaneous sales speak, you should be able to talk about your company’s offers clearly and reasonable without striking a mental chord. There are perhaps many more tips where these three came from, but these would suffice to give you that edge to in making communication work between buyer and seller. Do you have a Voicemail Strategy for your B2B Telemarketing? Gatekeepers are not the only ones that impede one’s success at telemarketing. More often than not, telemarketers fail to reach a certain prospect even after several attempts, in which case he may have to make do of just leaving a voicemail. Voicemails are but a part of the entire telemarketing game, but marketers dread having to deal with them. For one, they don’t represent any indication of success. It is merely a consolation; the fact that there is this one last way for your message to be heard. callbox https://www.callboxinc.com/assets/callbox-logo.svg callbox2014-01-15 23:15:572018-10-11 12:13:57Do you have a Voicemail Strategy for your B2B Telemarketing? By using sophisticated market targeting and tailoring calls to specific prospects, B2B telemarketing companies can increase the chances of any business to increase their sales. You can measure the depth of a telemarketing firm by being prolific data analysts and effective niche marketers at the same time. As it has been pointed out many times, the process doesn’t just involve generating leads – it’s about getting it from people who matter. The problem is that telemarketing has been a victim of its own success: the success of telemarketing in the past has attracted more competition. Now everybody wants to do telemarketing. While all that is happening, the target markets have been improving in terms of their ability to screen calls, provided by technology that surrounds them. Fresh arrivals. Shifting the efforts towards lists of new contacts in an area has two advantages. First, it can grab hold of new numbers before some other company provokes them to be registered on do-not-call lists, and second, it could help focus on an audience that is often in the market for new goods and services. Upgrades and Cross-Selling. The more names that do-not-call lists eliminate, the more valuable existing business relationships that are eligible for telemarketing calls become. Companies should look for ways to broaden those existing relationship. Tailor-fitting calls based on personas. When a sales pitch is customized to cater a specific audience, it becomes unique and it stands out from the crowd. To achieve this, though, a more effective segmentation system should be in place. Knowing exactly what type of prospect you’re talking to is huge help in making adjustments to spiels and responses. Affinity telemarketing. Marketers can build lists based on specific interests, using techniques such as running drawings and other contests at particular events. This is to put all the interested parties in one place and for marketers to obtain opt-in opportunities for telemarketing calls and identify target attributes for a more accurate targeting. Data expansion. A campaign should include efforts to broaden the information stored in the pipeline to include things like e-mail addresses and other pertinent data. This allows for multi-faceted approaches and also preserves a means of contact should a given number be eliminated from a list of eligible call numbers. Does the spiel remind you of someone or something? Right! It’s like monologuing. The call was dominated by only one person and hardly gave the other person a chance to speak. It’s a common mistake caused by different factors like extreme excitement, distractions, exhaustion etc. A conversation is a two-way communication – a speaker and a listener. When the other person talks, the other one listens, one person asks a question, the other one will answer and vice versa. Telemarketing, like all other business calls, requires a balanced conversation between the agent and the prospect; clearly understanding each other in order to come into a mutual agreement that would bring out favorable results to both – a lead, an appointment or a sale to the caller. So before you put on that headset and click the start button on your crm, bone up with some call to actions below that will drive you to confidently “start a conversation” with a prospective client. Smile. The prospect may not practically see you doing so but it’ll show through the pleasant tone of your voice. Keep a steady smile throughout the call and this will make you feel relaxed. Smiling uses only 26 muscles while frowning uses more with 62 – quite an effort. Open the call with a lively voice and positive tone greeting. That perky feeling will boost your confidence in delivering your pitch and help you crossover any crucial point in the call. However, excessive adrenaline rush might make you talk too much so remember to be in control. Keep cool. Speak Clearly. Rehearse your spiel and seek coaching before your start calling. This will ease the flow of your speech in a clear and professional manner that will induce comprehension between you and the prospect. Focus on one subject at a time. Use Courtesy Phrases and Power Words. Say “please”, “thank you”, and “you’re welcome”. These are courtesy phrases and power words like perfect”, “great”, or “good job” translate request, appreciation, and acknowledgement in a polite manner while boosting the prospect’s ego. Related: How to Maintain Pleasantness Throughout the Call? Build Rapport by Initiating Small Talks. Like “how are you today?”, “have you heard about the latest..” – discover tidbits of information to fully open the conversation and fill gaps like “ahh”, “uhm”, well ahh” in the call. Probe. Ask open-ended questions that will unleash substantial information from the prospect, which in return will make you understand the prospect’s point of view. At some point, deadlines and quota may press you to assert your purpose like getting the prospect to say yes to an appointment. That’s fine but don’t trap him in closed-ended questions like, “so you’re currently evaluating, well good, our consultant can give you a good deal, would an office meeting at 3pm on Monday, work for you?” – pushing his back against the wall is a no-no. Here’s how to Weed out Junk Leads With Predictive Lead Scoring. Download FREE EBOOK here! Profile your prospect. Know which type is the prospect: driver, analytical, amiable, or expressive. Watch nonverbal cues to adjust your tone and the conversation flow based on his psyche. Join their Circle. Learn about their industry and the services they provide by going through their company website, and by reviewing some social media sites they engage in to get yourself updated with their activities and understand their thoughts towards issues. This will give them the impression that you share a common interest with them. Be a Subject-matter Expert. Beef up your brains with the information about the subject that you will be discussing with the prospect. Speak about the topic with authority. Be knowledgeable and spontaneous but be sure to acknowledge the prospect’s opinion or suggestions in order to have a balanced conversation. Prospect: We do … we need an upgrade. Caller: Oh I see, looks like our system is a perfect fit…. Would you be open for a consultation? Prospect: I would , if that doesn’t take much of my time..
Caller: Certainly not Rob., just a 10-15 minute talk.. Would Monday next week at 10 am work for you for an office meeting? Caller: Perfect then, thank you Rob, you have a great day. So how does that sound to you? Set more appointments with our Multi Channel Marketing Approach.